On Sunday for a while I watched the reading of the names at Ground Zero. It brought up my own recollections of that day, of course. We lived directly on Long Island Sound at that time, and had an amazing, unique view across the water to the lower half of Manhattan Island. That day was so clear you could practically see the windows in the Towers, which rose in the distance like a number eleven on steroids. We were building our home at the time, living in a cottage on the property. That morning, fifteen or so men, mostly of Portuguese ethnicity, were putting on the roof shingles. I was in the cottage watching the Today Show when they cut to the scene. 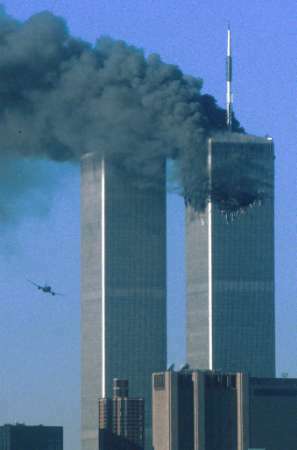 Katie Couric said, “A small plane has crashed into the World Trade Center.” Didn’t even vaguely look like a small plane to me. How could Katie even say that with a straight face? In the first of many reality checks of the day, I went outside to affirm that what I was seeing on television was actually happening, or maybe vice versa. Indeed it was real; you could see the first tower burning across the Sound, smoke rising up into the sky in a huge dark plume that already dwarfed both towers. The fifteen Portuguese roofers were standing on the plywood up there, transfixed. And silent, except they had a radio going, a newscast, I think–in Portuguese. A few of them looked at me, maybe wondering if they should continue. I didn’t know. I went back into the house just in time to see the second Tower hit. I began to make my check-in-with-family phone calls. When the first tower fell, I happened to be outside looking at the actual view, and it seemed like a disappearing act from that 20ish mile distance. One moment, two buildings; the next, one. An hour or so later, our neighbor across the street came over, distraught. His wife was working at the time in Tower 2, 84th floor, and he hadn’t heard from her. (She did manage to make her way down, though lost many of her colleagues, and this couple went to memorial services for months.). All day long, strangers kept stopping by the house just to just stand and witness the thing from our vantage point, the plume of thick dark smoke spreading like a halo over Manhattan. Ten years later, as I listened to all those people read the names of their dead, I couldn’t help thinking of my own loss, though it had nothing to do with 9/11. (How could I help it when James Taylor played a song I used to sing to my toddler son, You Can Close Your Eyes?) It seems to me that the reading of names stems from a deeply human, universal need to bring the dead back into the world of the living. I know I feel grateful when someone mentions my son or speaks his name. And too, I found it deeply moving to hear each person offer their personal thoughts, prayers, and feelings, which seemed mostly unscripted and authentic to me. So rare nowadays. Everywhere we turn, we find ourselves inundated by so much that is packaged and canned that it seems we have been unalterably changed as a people, possibly unable to identify what should be obviously false. Maybe Katie Couric unquestioningly repeating what she had been told, that a small plane had hit the tower, was some kind of watershed 1984 moment. In the aftermath of all this, the Bruised Muse would like to express a thought or two about our survival not as individuals who’ve suffered loss, but as a country. Get ready, since this is a rant. A few days ago a report came out that the United States of America had spent 3.3 TRILLION dollars (that’s Trillion with a T) on the two main wars we’ve engaged in since 9/11. Supposedly, we went to these wars because of 9/11, the Bush Administration touting the idea that we had to be on a war footing. Yet most if not all of the ACTUAL victories against the terrorists, before and after 9/11, have been either special ops or police work. Whatever the reason the Bush Administration wanted the Iraq war–maybe Rumsfeld wanted to test his new war toys or theory, or Bush the younger wanted revenge–it should be clear now to anyone with any critical thinking skills at all that the war was scandalously, monumentally unnecessary. It amazes me that all these years later, no one has been called to pay for the lies they told to convince the country to support that total bait and switch operation. Worse, that Administration was so effective in telling their lies that many American citizens, voting citizens, apparently STILL believe there was some relationship between Al Queada and Saddam Hussein. The only problem with democracy is that anyone can vote. Which of course is also its main strength. Yet a huge problem now, in my view, is that our population has become so gullible as a result of ever more sophisticated packaging and canning (ie marketing/pr) that in the absence of a skeptical press (not a polarized press, but a skeptical one), Americans who can’t or won’t educate themselves can STILL vote. And then there’s Afghanistan, which I supported in the beginning, although I thought they should have put more money and special ops personnel into cornering Bin Laden at Bora Bora, which they would have if they hadn’t been set on their Iraq bait and switch. But it’s TEN YEARS LATER, and I recently heard a NY TIMES reporter on NPR ((than God for NPR and the NY TIMES, what’s left of it) that things are worse than ever there. Consider the attack just today on the US embassy there. I mention all this because, I’ll say it again, WE HAVE NOW SPENT 3.3 TRILLION. Isn’t THIS a HUGE part of the reason we’re now bankrupt? Are we so lost that rather than speaking the truth about why we’re bankrupt, we have a group of politicians of apparently growing influence proposing (and the people BUYING) that the way out of bankruptcy is to give more money to the richest of us, cut programs that give food to babies, take the people who’ve just gotten health coverage off again, and roll back all the regulatory progress we’ve made in the last fifty years? THIS will save the country? What country? Do they really think that unregulated corporations interested only in profit will police themselves? Do they REALLY want to be poisoned by the water, air, food? Or maybe they LIKE the idea of seeing another Triangle Shirt Factory fire? It’s bad enough that a miserable creature like Ann Coulter can get away with saying on national television that the she’d never seen so many enjoying their husband’s deaths as the 9/11 widows; my guess is she’d actually revel in seeing little girls jump out of windows (as long as they’re liberals jumping). But my goodness, where are we as a country when they can call a moderate like Obama a SOCIALIST and so many believe it, share it, like it, tweet it? And when on a nationally televised debate of so-called mainstream Republican candidates, all except one says he (or she) doesn’t believe in climate change or evolutionary science. Which of course, means non-belief in every interconnected branch of science too, from archeology to zoology? And when on the same debate the moderator asks the leading candidate if we should let a thirty year old uninsured person die because he doesn’t have health care, and the candidate says “Yes.” AND THE AUDIENCE GOES WILD IN SUPPORT. Well, calling Barack Obama a socialist is truly laughable, but these people are, plain and simple, extremists, and they seem to me to want the country to go back to a time when the people gathered in the town square to watch the hanging. They’re all saying they’re scared of Obama, they want their country back. Is THIS their country? A country that cheers on the idea of letting a 30 year old die because he doesn’t have or can’t get insurance? Honestly, we should ALL shudder at the thought of someone like Rick Perry (or Sarah Palin or Michele Bachman) as President. These people, for all their patriotic blathering, don’t even seem to believe in democracy, they seem to support some kind of fundamentalist, anti-intellectual, anti-science theocracy. I’ve been reading Eric Larsen’s book: In the Garden of the Beasts. In Hitler’s Germany, the takeover of a government and a people was gradual and insidious. Demagogues start by subtly whipping up underlying biases and fears, and then offering easy answers that people cling to to allay those fears. And no one notices the true implication of what’s happening until until it’s too late. This should chill the blood. Electing some of these people could easily turn us into those who attacked us. I could not agree more I watched in total disbelief as people cheered both Ron Paul’s answer and the hundreds of executions that Rick Perry “hosted”. Well, at least I read it!